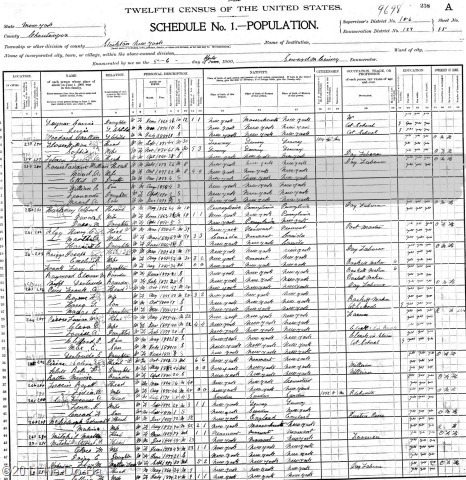 My post today will examine the second Stockton, NY 1900 Census page containing a Kanistanaux family. I found William with a wife and young family. William Kanistanaux, head, white, male, b. July-1873, 26, married 8 years, he and both parents born in New York, day laborer, he can read, write, & speak English, he is a home owner with a mortgage. Maud A. Kanistanaux, wife, white, female, b. Oct-1877, 22, married 8 years, mother of 4 children all still living, she and both parents are born in New York, she can read, write, & speak English. No real surprises here but a few things to make note of. The entire household is listed as white. William claims he is born in New York along with both parents, but his parents always claimed he was born in Canada while he was living at home. His mother still claims she was born in Canada. William has been married 8 years, so I should try to locate a marriage record for the couple around the year 1892, possibly in the fall or winter of 92-93, since the 1st child in born in November of 1893.